can be cooked in a Japanese way. Fennel is not a vegetable I cook very often, either. When we were first married, the apartment complex we lived in encouraged tenants to grow flowers around the buildings. Ever practical, I planted vegetables among the flowers. Tomatoes and basil were my favorites, growing on the side of our building, but fennel was an intricate and pretty background for the flowers in front. My baby/toddler daughter and I spent many happy days outdoors tending the gardens. A few days ago, Mr. Tess bought some fennel, but didn’t cook it. I don’t remember how I used to cook fennel, so it’s fortuitous that my project-book includes a recipe. 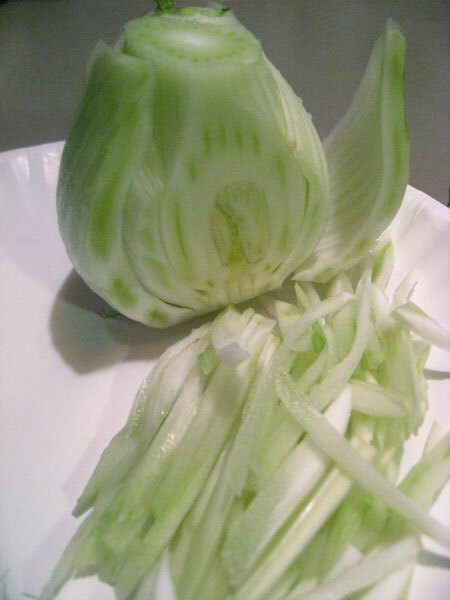 Whoever would have looked in a Japanese cookbook for a fennel recipe! • Heat a wok and add oil. When the oil is hot, add the fennel and carrot. Cook over high heat for 2 minutes, stirring constantly, until the vegetables are coated with oil. • Add the dashi and 1 1/2 tsp. sugar. Cook until almost all the liquid is absorbed, stirring constantly. Add the shoyu and cook until it’s absorbed. Note: I should have cooked the vegetables a bit longer; they were still too very crunchy for my taste. • Add the seven spice powder and sesame seeds, and give the veggies a few large stirs. • Taste and add 1 1/2 tsp. sugar if you like. Drop the tamari onto the hot surface of the wok to burn it instantly, then toss with the vegetables. Serve hot. To complete the meal, I made Chicken in Spicy Marinade, which is a good make ahead summer recipe. The chicken is extra tasty when it’s grilled. 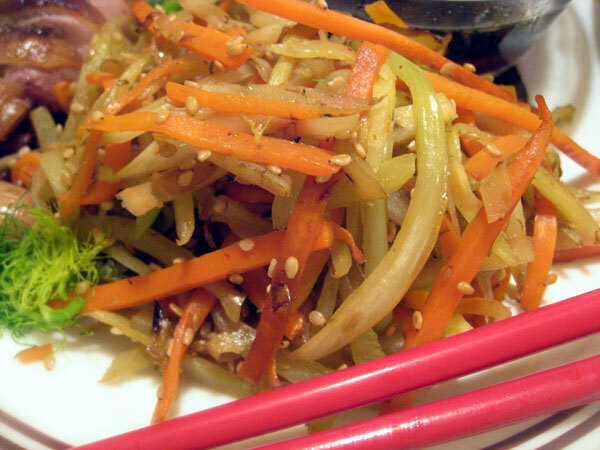 I’ve never even thought of combining fennel with Asian flavors! The only time I ever use fennel is with Italian sausage and tomatoes for pasta, so I’m really curious about what fennel tastes like with soy sauce. Really interesting use of this vegetable, Tess! This looks like a tasty combination. I even like the way you sliced the fennel. If your interested in a few French fennel recipes, stop on by. That is probably what Mr. Tess was planning to make, but it got too late to cook so we ordered out. 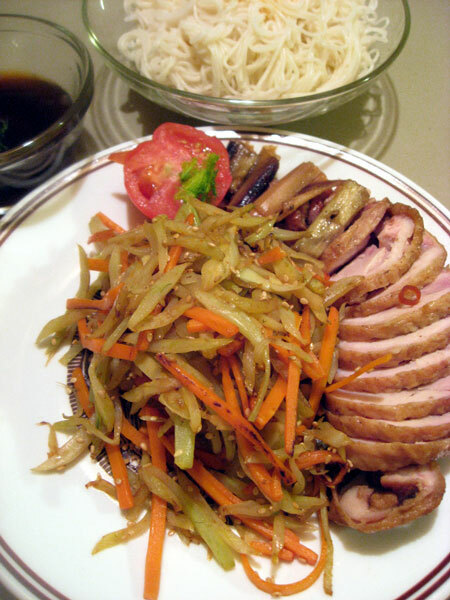 Ms. Shimbo’s book includes a few recipes that use traditional Japanese ingredients, then a similar recipe that uses the same cooking method with non-Japanese ingredients. 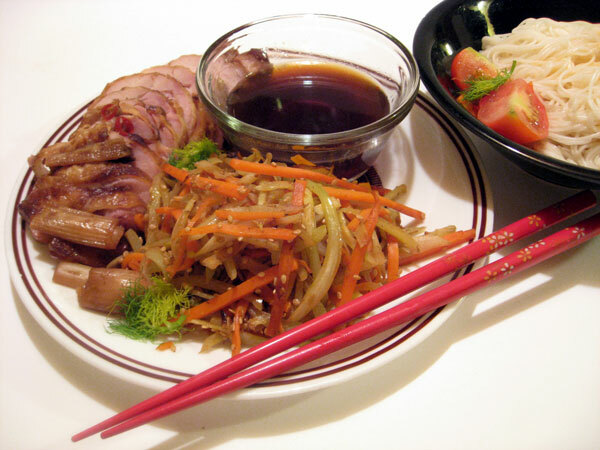 She also makes suggestions for using different ingredients in her introductions to some of her traditional recipes. 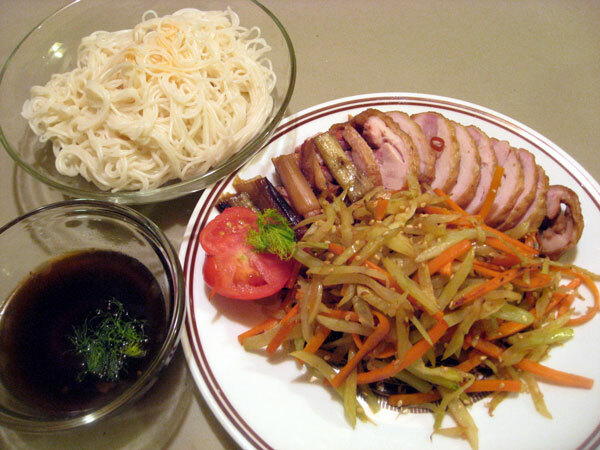 If you think about Chinese dishes that use star anise, maybe fennel (which has a similar but much more delicate flavor) is not so strange? This dish was good, though as I said, I should have cooked the vegetables a tad bit longer. Mr. Tess liked it crunchy. Thanks, it’s not fancy knife skill: I used a mandoline. I looked at your site and am impressed! The Poisson en Papillote sounds really good. The French use origami for cooking! My favorite French vegetable has to be white asparagus. We visited a family in Normandy during a D-Day commemoration. Louis was growing white asparagus in his garden, using sand from Omaha Beach. It was amazing. Well, the whole experience was amazing. Tess, I am so excited that I tried your recipe. It’s absolutely delicious & I’ve never ever tasted anything like this before. I used fennel & asparagus grown from my garden. I am now going to explore more of your recipes. Thank you for this!